Kuala Lumpur, January 2015 – Still remember my previous post on Taeyang World Tour Concert in Malaysia 2015? In 2015, BIGBANG’s member TAEYANG had announced his first solo world tour concert “RISE”. The concert kick started in Korea in October 2014 and has been receiving enthusiastic responses from his fans. RM 1.5 Million Production Fees! IME PRODUCTIONS, Malaysia’s organizer stated that they had spent up to 1.5 Million of the production fee in order to bring over Seoul concert’s high specification production and stage effects to Malaysia. Special Walkway! Closer Distance With TAEYANG! The stage walkway is divided into various areas; hence, TAEYANG will have a closer distance with his fans by utilizing the walkway. Apart from that, there will be as much as two hundred staff from both Korea and Malaysia production crew, to present the best audible and visual experiences to the fans in Malaysia. In a return to the fans who have bought the concert tickets, 500 lucky VIP and Rock zone ticket holders will be selected to watch TAEYANG Sound Check Party while 10 lucky VIP ticket holders will stand a chance to get up close with TAEYANG at the ‘Meet & Greet’ and Photography session. Lucky winners will be drawn by the organizer based on tickets’ barcode number. In conjunction with “RISE” World Tour Concert, TAEYANG had released a limited edition album “RISE” to repay his fans. The limited edition album includes additional three (3) live version songs. Five hundred (500) pieces of the TAEYANG “RISE” World Tour Edition will be released but not in any music stores. Those who interested to preorder, please drop e-mail to IME Productions (mdimemy@gmail.com), RM 50 per album. 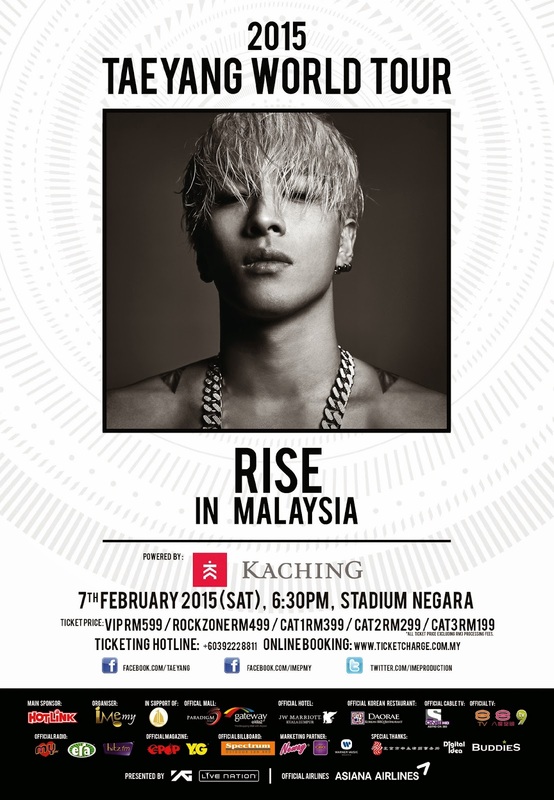 About 70% of the tickets have been sold out for 2015 TAEYANG “RISE” World Tour Concert in Malaysia, which is proudly brought to you by IME Productions and presented by KACHING. The concert will be held on 7th February 2015, 6:30pm at Stadium Negara. To those who wish to purchase tickets, you can get it through TicketCharge website http://www.ticketcharge.com.my or through the ticketing hotline 03-92228811 as well as authorized ticketing outlets. Visit IME Productions Facebook page for more details on the concert http://www.facebook.com/imepmy.